Ericsson and Ambra Solutions have worked together to deliver the Canada’s deepest underground LTE network for the Agnico Eagle mining site, LaRonde in Abitibi, Quebec. Underground at LaRonde. Courtesy of Agnico Eagle. LTE cellular networks can provide data and voice mobility services over low frequency bands that allow a better propagation than any other currently available technology, delivering faster, more advanced wireless technology. The network in LaRonde is utilizing band 5 at 850MHz. Ambra is the only Canadian operator deploying private LTE networks in underground mines. LTE networks open a new suite of capabilities and possibilities to cost effectively enable many smart mining related tasks for open pits or underground mines. 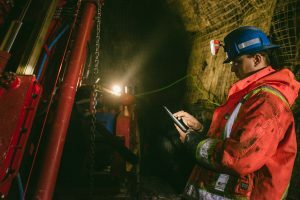 Unlike other options, LTE networks allow the use of IoT sensors and devices to monitor, operate and collect data throughout the mining site, for example related to air quality monitoring. This includes remote control operation of mining machinery, dispatch systems, emergency notification systems, access control systems, automated collection of data, ventilation fan monitoring and gas detection systems. Agnico Eagle is a senior Canadian gold mining company with eight mines in Canada, Finland, and Mexico. LaRonde is Agnico Eagles flagship mine, located in the Abitibi region of northwestern Quebec. LaRonde has produced more than 5 million ounces of gold since it opened in 1988.